Author and artist Mary B. Kelly shares her love of textiles in Goddess Women Cloth: A Worldwide Tradition of Making and Using Ritual Textiles. 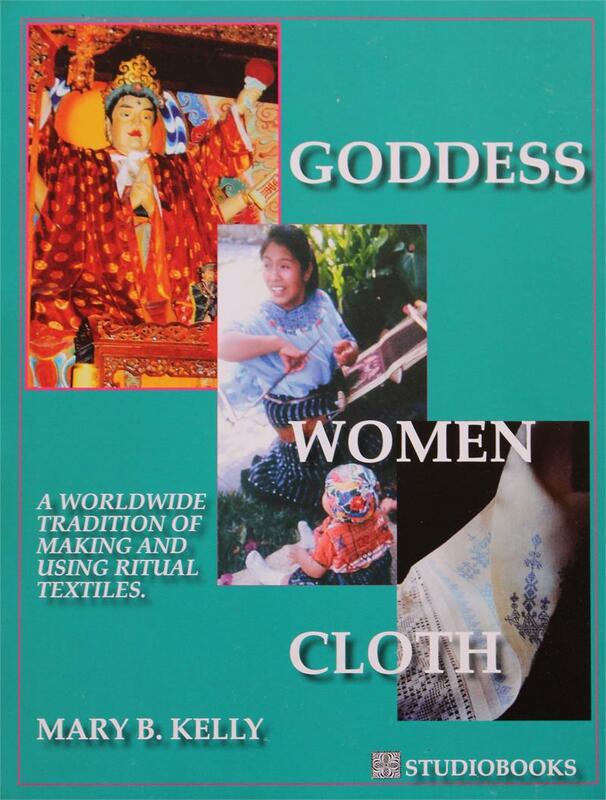 Across the world, textiles often display strong, colorful symbols and images of female deities. Made primarily made by women, they were intended for protection and to encourage fertility in their fields, flocks and families. This embellished cloth and clothing was offered to their deities and used by men and women throughout history as part of the rituals of folk culture. In some areas these traditions continue today. An introduction presents an overview of the history, rituals and religious beliefs of such cultures. In eight chapters that include Siberia, China and the Far East, India, Central and South East Asia, Eastern, Northern and Central Europe, Greece and the Balkans, Africa and the Americas the author shares her knowledge and research on local traditions. Interested in symbols and rituals originating in the Old World, she documents their progress as they were carried by groups emigrating into the New World, as well as symbols used by indigenous peoples. Each chapter addresses a human need, a series of ritual responses that arise to answer it, specific symbols related to the ritual that are produced on the textiles and other ritual objects, and goddesses and gods to whom the rituals are offered. The book also looks at the crucial connections to these deities and spirits obtained by the ritual and ritual cloth. They are compared cross-culturally; for example, the embroidered ritual cloths prepared to lower the coffin into the grave in north Russia and Ukraine and the woven blankets which wrap the dead in the Central and South American sacred bundles. Both signal protection and recognition in the next world. At the end of each chapter, a featured ritual, told mainly in the first person by a ritualist or an ethnographic participant, allows the reader to 'attend' a selected ceremony through the eyes of a woman from that culture. A conclusion summarizes this worldwide phenomenon and assesses the future of ritual textile folk art. The author has traveled widely and published her meticulous descriptions of textile collections in the United States and abroad. Interviews with textile producers, descriptions of rituals practiced in their areas and explanations of the symbols used to embellish the textiles, make this book a pleasure to read and a resource for research.